A cookie inside a cookie. What could possibly be wrong with that concept? Beat margarine and sugars together until creamy. Add “egg”, vanilla, beat until smooth. In a separate bowl, sift together flour, baking powder, baking soda, cream of tartar, and salt. Add flour mix to margarine mix, combine well. 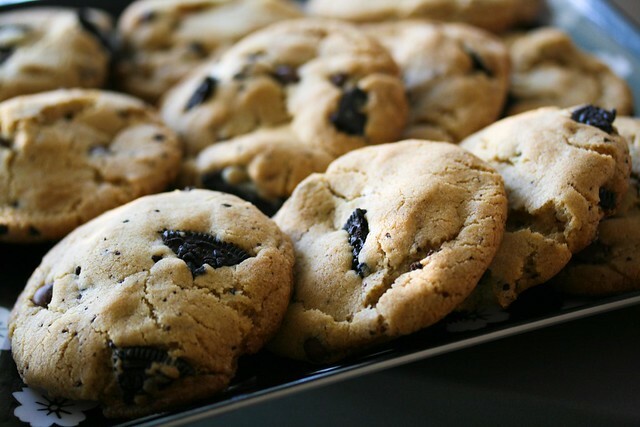 Add oreo pieces and chocolate chips with your hands, being careful not to crush oreo pieces too much. Form into balls, 1 1/2 tablespoons worth of dough per cookie. Pat them down just a little. Place on baking sheet. Bake for 10 minutes, or until the edges are brown. OMG. Just found these. You blow my mind my friend. I finally made these last night and they are fabulous. Loved them and so did everybody that had some. thanks again for yet another awesome recipe. what is up with companies taking one step forward, twelve steps back? for shame. I don’t use regular butter or eggs, so I don’t know.